In 1949, Jack Sheedy, the owner of a San Francisco-based record label called Coronet, was talked into making the first recording of an octet and a trio featuring Dave Brubeck (This Coronet Records should not be confused with either the Australian Coronet Records or the Coronet Records of the late 1950s that was based in New York City). Sheedy's Coronet Records had recorded area Dixieland bands. But he was unable to pay his bills, and in 1949 he turned his masters over to a pressing company, the Circle Record Company, which was owned by Max and Sol Weiss. The Weiss brothers changed the name of their business to Fantasy Records and met an increasing demand for Brubeck's music by recording and issuing new records. Soon the company was shipping 40,000 to 50,000 copies of Brubeck records per quarter. When Brubeck signed with Fantasy, he thought he had 50 percent interest in the company. He worked as an unofficial artists and repertoire (A&R) assistant, encouraging the Weiss brothers to sign Gerry Mulligan, Chet Baker, and Red Norvo. When he discovered that all he owned was 50 percent of his own recordings, he signed with Columbia Records. In 1955, Saul Zaentz joined the company. Jazz musician Charles Mingus gave Debut Records to Zaentz as a wedding gift; at the time, Zaentz was marrying Mingus's ex-wife, Celia, who had helped found Debut with Mingus and musician Max Roach. After an unsuccessful attempt by Audio Fidelity Records to buy Fantasy, Zaentz became president in 1967. He and a group of investors bought Fantasy from the Weiss brothers. He then acquired Prestige Records (1971), Riverside (1972), and Milestone (1972). Ralph Kaffel, who was vice president of Fantasy since 1971, became president in 1973. He continued the policy of acquisitions: Stax Records (1977), Good Time Jazz (1984), Contemporary (1984), Pablo (1986), Specialty (1991), Kicking Mule (1995), and Takoma (1995). Fantasy's first subsidiary was Galaxy Records in 1951. Years later, it started the short-lived subsidiary Scorpio, which tried to capitalize on the British Invasion. Still later, it had a subsidiary named Reality Records that concentrated on hip hop and released the first two albums by Doug E. Fresh. Vince Guaraldi proved a stand-out when he joined the company in 1964. His most famous contributions to Fantasy were his compositions involved in the film adaptations of the comic strip Peanuts by Charles M. Schulz. This association began with Guaraldi's album, Jazz Impressions of "A Boy Named Charlie Brown", which contained music he created for an unsold television documentary of the same name, but truly became most famous with the hailed soundtrack of the classic Christmas special A Charlie Brown Christmas, the album of which itself has become a perennial Christmas best-seller. This success would lead to numerous other Peanuts compositions for the rest of Guaraldi's career, selections of which were subsequently released by Fantasy. Saul Zaentz's acquisitions had been funded in part by the success of the rock group Creedence Clearwater Revival, a group that he had managed. Creedence was signed by Fantasy Records in 1964 as the Blue Velvets, but the label renamed it the Golliwogs so it would fit in with the bands of the British Invasion. 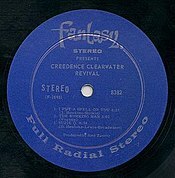 After a series of failed releases under that name on the Fantasy and Scorpio labels, the group changed its name to Creedence Clearwater Revival. In 1968, it released its first hit record, a cover version of the song "Susie Q". In 1971, Fantasy built its headquarters at the corner of Tenth and Parker in Berkeley, California. The building was nicknamed "The House That Creedence Built". In 2004, Fantasy was sold to a consortium led by American television writer, producer, and activist Norman Lear and merged with Concord Records to create Concord Music Group. Although some operations were still located in Berkeley, the label is now headquartered at the Concord location in Beverly Hills, California. Shortly after Fantasy was purchased by Concord, John Fogerty, the lead singer and songwriter of Creedence Clearwater Revival, re-signed with the label after leaving it in the mid-1970s after a falling out with Zaentz, who died in 2014. Fantasy Studios closed in 2018. ^ a b c Kernfeld, Barry (2002). Barry Kernfeld, ed. The New Grove Dictionary of Jazz, vol. 1 (2 ed.). New York: Grove's Dictionaries Inc. p. 739. ISBN 1561592846. ^ Gioia, Ted (1998). "Dave Brubeck and Modern Jazz in San Francisco". West Coast Jazz: Modern Jazz in California, 1945–1960. Berkeley, Calif.: University of California Press. pp. 63–64. ISBN 0520217292. ^ Gioia, Ted (1998). "The San Francisco Scene in the 1950s". West Coast Jazz: Modern Jazz in California, 1945–1960. Berkeley, Calif.: University of California Press. pp. 94–95. ISBN 0520217292. ^ "Billboard". Google Books. Nielsen Business Media. 25 March 1967. pp. 6–. Retrieved 25 April 2018. ^ a b "Fantasy Records". www.zaentz.com. Retrieved 11 September 2015. ^ "2600 Tenth Street". Warehamproperties.com. Retrieved 2013-07-13. ^ Saperstein, Pat (2014-01-04). "Oscar-Winning Producer Saul Zaentz Dies at 92". variety.com. Variety Media LLC. Retrieved 2014-09-14. ^ Corliss, Richard (2014-01-09). "Saul Zaentz: What Does a Producer Do, Anyway?". time.com. Time Inc. Retrieved 2014-09-14. ^ Dinkelspiel, Frances (31 July 2018). "Berkeley's Fantasy Studios closure came because of financial struggles". berkeleyside.com.